The Quabbin Reservoir from The Enfield Lookout in Ware, Mass. 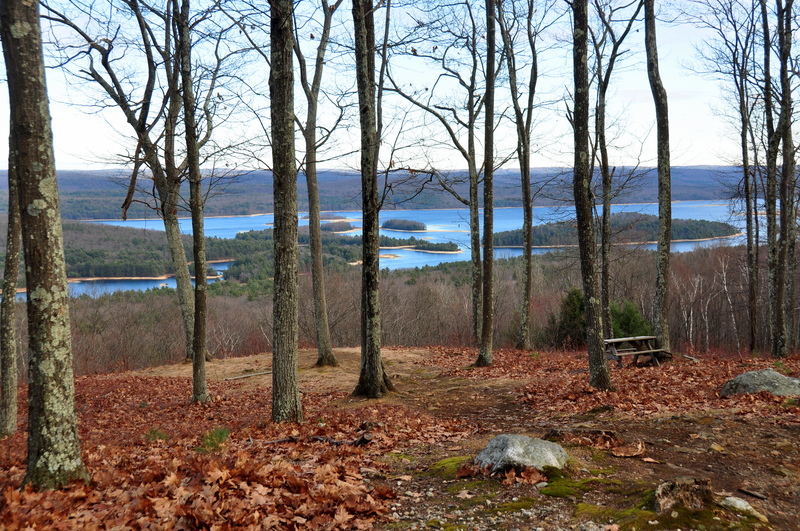 As I return to my blog, after many months away, I wanted to speak about an area I find myself visiting more and more often: the beautiful Quabbin Reservoir. Visits to this vast area fill me with feelings that are truly mixed –my ambivalence showing all too plainly on my face: feelings of awe and wonder as I look around me mixed with sadness and bitterness as I remember its origins (See previous blog entry). I come across ruby-red columbine, delicate ladyslippers, and ferns of every shape and size. Occasionally I am pleasantly surprised by a doe or buck peering at me through the woods. More often I stumble upon newts, turtles, or dragonflies. For better or worse, I have never come face to face with any of the Quabbin’s reported inhabitants: coyotes, bobcats, black bears, beavers , raccoons, moose, and foxes. As of yet, I have not seen any of the Quabbin’s famous bald eagles or red-tailed hawks, though many of my friends have viewed these majestic birds. 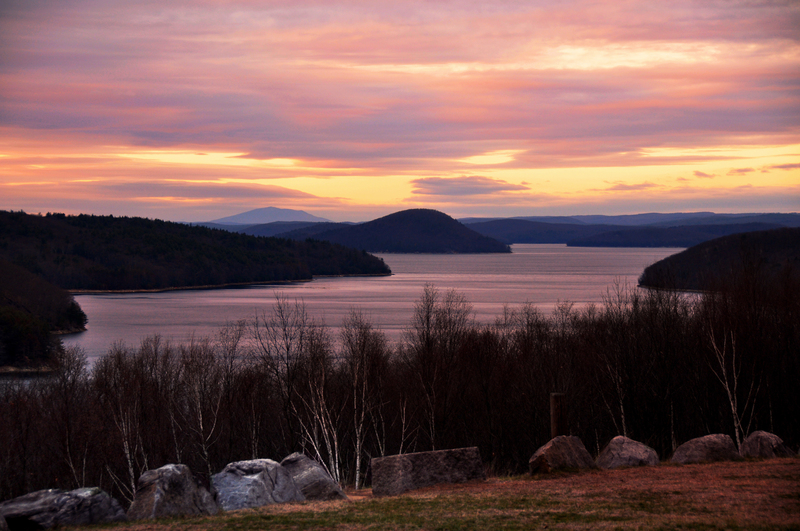 The photo above was taken at sunset on a day during which I was introducing my brother and my sister-in-law to the sheer magical beauty of the Quabbin. We were at the Enfield Lookout in Ware, Massachusetts. As gorgeous as the view clearly was, our joy was greatly tempered by the realization that the waters sitting several hundred yard below us covered the remains of the town of Enfield. The Quabbin Reservoir’s supplies 2.4 million people (most from Boston and over 40 communities in the Boston Region) with 260 million gallons of water a day. All of this water came at great cost to the nearly 3000 citizens of the four towns that were destroyed in order to create this huge reservoir. What remain for the citizens here is a vast wilderness of indescribable peace, solitude, and beauty. Once (and for about 200 years) there were four lovely, small towns in North-Central Massachusetts. There nearly 3000 people lived, farmed, built small industries, attended school, worshiped in church, celebrated births and graduations and grieved over losing loved ones. In Dana, Greenwich, Prescott, and Enfield, families built their homes and lives together. All of this came to an end in April, 1938 when the four towns were sacrificed–dismantled, torn apart, and flooded–in order to create the Quabbin Reservoir. This huge reservoir provides drinking water to the city of Boston and 40 other cities and towns in the Greater Boston region (among them are Arlington, Belmont, Brookline, Chelsea, Clinton, Everett, Framingham, Lexington, Malden, Medford, Melrose, Milton, Newton, Norwood, Quincy, Reading, Revere, Somerville, Stoneham, Waltham, Watertown, and Winthrop. It also provides water for Chicopee, Lynnfield Water District, Marblehead, Nahant, Saugus, Southborough, South Hadley, Weston, and Wilbraham). It contains 412 billion gallons of water in an area of 38.6 square miles, but its watershed area is a full 185.9 square miles. It is 18 miles long, and its shoreline is 118 miles, in total. Its average depth is 51 feet, but it is 150 feet deep at its maximum depth. In the past month, I have spent more time in the Quabbin—in parts of the Massachusetts towns of New Salem, Ware, and Belchertown–than in the previous 37 years I have lived here in Central Massachusetts. It is a lovely area–ideal for hiking, fishing, and other recreational activities. Yet, as I learn more about its origins, I realize that every time I visit, just as I am enchanted by its beauty, so too am I saddened–often beyond words–by the awesome and awful sacrifice that four towns made so that Boston and 40 other communities could have pure drinking water. This is the Keystone Bridge in New Salem, a small town in the North Quabbin Region of Central Massachusetts. Our camera club, the North Quabbin Viewfinders (in Athol, MA) went here as part of one of our bi-monthly field trips. I shot the bridge with my Nikon D700, ISO 200, f 22, 85 mm, with a shutter speed of three seconds to blur the water. I then processed it in Dynamic Photo HDR.